Background: Emergency Peripartum Hysterectomy (EPH) is a lifesaving surgical procedure. The higher incidence of EPH in developing countries is because of the higher prevalence of risk factors of primary postpartum haemorrhage like, multiple pregnancy, grandmultiparity, cephalo-pelvic disproportion and prolonged obstructed labor/uterine rupture, previous caesarean section. The increasing incidence of the procedure in developed countries has been attributed to the increasing caesarean section rate which predisposes to placenta previa. Aims & Objective: To estimate the incidence, indications and complications associated with peripartum hysterectomy performed at a tertiary care hospital. 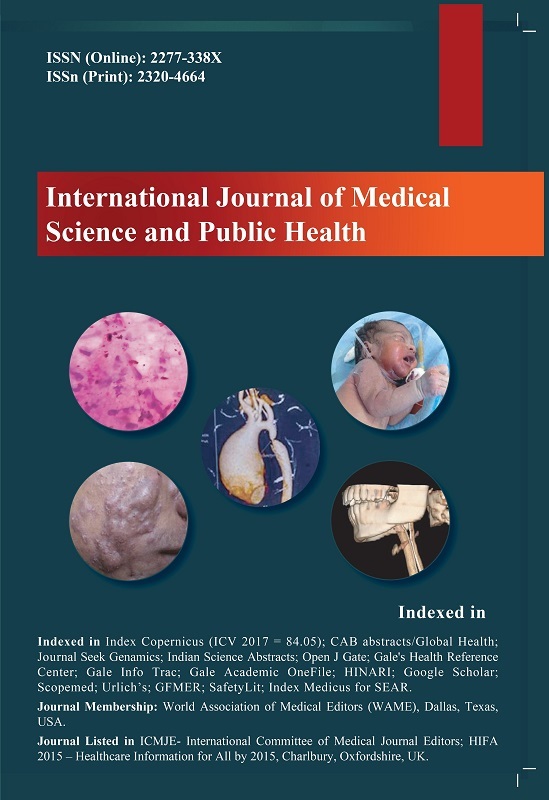 Material and Methods: The retrospective observational analytical study was conducted at the Department of Obstetrics and Gynecology, Lady Goshen hospital, Mangalore from January 2012 to December 2012. Records of all patients who had undergone peripartum hysterectomy during the study period were explored for age, parity, booking status, indication and the type of operation performed. Maternal morbidity and mortality were also recorded. Results: During the study period there were 5497 deliveries, out of which 6 women had undergone an EPH. The incidence was 1.2/1000 deliveries. The main indication was uterine atony 4 (66.7%), followed by rupture uterus 1 (16.7%) and placenta previa with placenta accreta 1 (16.7%). Maternal complications included febrile illness (50%) and anaemia (33.3%). All women, 6 (100%) required blood transfusions, 2(33.3%) cases transferred to ICU. No maternal deaths occurred. Conclusion: The leading indications for emergency peripartum hysterectomy in our study are uterine atony, placenta previa with placenta accreta and uterine rupture. The higher incidence of emergency peripartum hysterectomy is because of the higher prevalence of risk factors like multiparity, previous caesarean section and cesarean section in the index pregnancy. Proper antenatal care, early identification of risk factors and timely intervention by an obstetrician are necessary in preventing this disastrous event. Key words: Previous cesarean section; Peripartum hysterectomy; Uterine atony; Maternal morbidity. 5. Shellhas CS, Gilbert S, Landon MB, Verner MW, Leveno KJ, Hauth JC, et al. Eunice Kennedy Shriver National Institutes of Health and Human Development Maternal-Fetal Medicine Units Network. The frequency and complication rates of hysterectomy accompanying cesarean delivery. Obstet Gynecol. 2009; 114 (2 Pt 1):224â€“9.18. 7. Rabenda-&#321;acka K, Wilczy&#324;ski J, Radoch Z, Breborowicz GH. Obstetrical hysterectomy. Ginekol Pol. 2003;74:1521-5. 10. Kant A, Wadhwani K. Emergency obstetric hysterectomy. J Obstet Gynecol India. 2005;55 (2):132-134. 12. Khan B, Khan B, Sultana R, Bashir R, Deeba F. J Ayub Med Coll Abbottabad 2012; 24(1):14-17. 13. Cieminski A, Dlugoliecki F. Placenta previa accreta. Ginekol Pol. 2004;75(12):919-25. 18. Ehtisham S. Emergency Peripartum Hysterectomy. Pak J Surg 2011; 27(4): 288-291.